Central vein stenosis (CVS) is commonly seen in patients on hemodialysis. 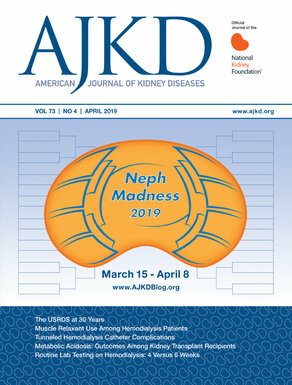 A recent review by Dr. Anil Agarwal in American Journal of Kidney Diseases discusses the causes and prevention of this entity. The following questions based on the article will test your knowledge on CVS. 2. Which of the following increases the risk of CVS? 3. A cardiac rhythm device should ideally be placed ipsilateral to an arteriovenous access. 4. Angiography is recommended prior to the placement of arteriovenous access in patients with a history of previous upper body central venous catheter. 5. What is the most effective strategy for the prevention of CVS? Post prepared by Dr. Matthew A. Sparks, eAJKD Advisory Board member. To see answers, please click here.